The NEO X8-H comes pre-installed with Android™ 4.4 KitKat, offering an array of upgrades and features not available on previous Android™ OS versions. 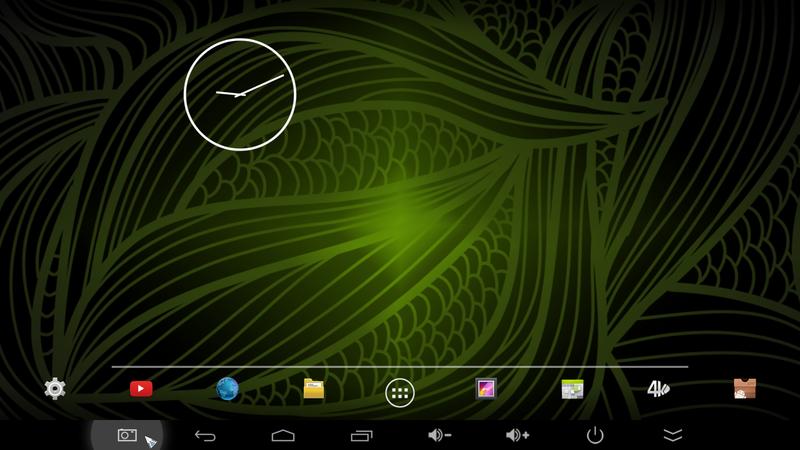 The NEO X8-H takes full advantage of the improved memory management of Android™ 4.4, with smoother multi-tasking as users switch between applications with ease. The NEO X8-H comes equipped with a Quad-Core ARM Cortex-A9r4 processor, delivering exceptional levels of performance and power efficiency. 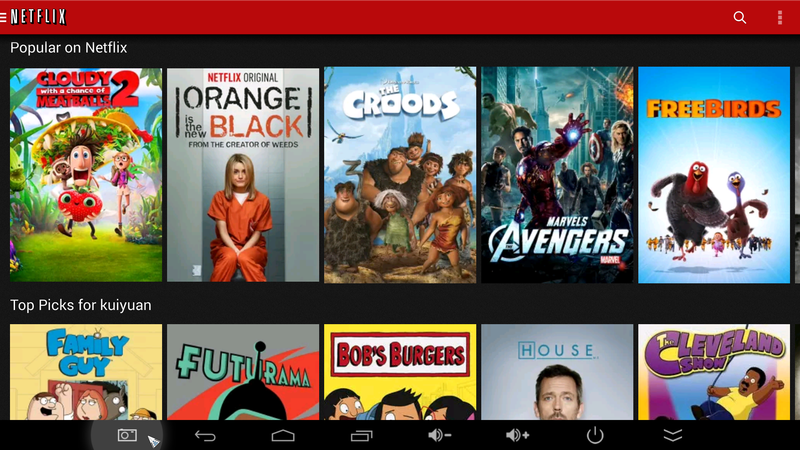 It is the first 4K Media Hub for Android™ designed to be plugged in and left on stand-by mode when not in use. There is no need to power-off the NEO X8-H, with the Quad-Core ARM CPU’s exceptional built-in thermal control management system protecting against any heat issues, giving customers peace of mind they can leave their device on 24/7/365. The Octo-Core Mali-450 GPU takes graphic performance on the NEO X8-H to new levels, offering double the performance of its predecessor, the Mali-400. The GPU is focused on maximizing processing efficiency, ensuring the NEO X8-H delivers superior image quality and a great graphics experience. The NEO X8-H can handle all the latest Android™ games titles with ease, and truly is the perfect solution for any keen Android™ gamers. Unlike conventional single-band antennas, the NEO X8-H’s unique external antenna offers the use of both 2.4GHz and 5.8GHz frequency ranges. The 5.8GHz frequency is less prone to interference, and therefore offers far superior reliability and stability, perfect for those wishing to stream Full HD media content onto their NEO X8-H.
Whilst previous MINIX Media Hubs have offered NAND Flash, the NEO X8-H utilizes eMMC “embedded Multi-Media Controller’ memory. The utilization of eMMC memory offers an array of benefits in terms of performance, security and reliability, ultimately delivering a richer end-user experience. You can be rest assured that your media content is safely stored on the NEO X8-H, with its built-in power management system and flash memory controller. For the untrained eye, it appears to be nothing special but MINIX has added four foot pads on each corner of the NEO X8-H, adding stability to it. Now let’s turn it around and have a look at the ports it brings. The MINIX NEO X8-H comes with a detachable SMA antenna, which you can find in the package. The Wifi signal signal strength is better than any of the TV Boxes i have ever tested before. The box has a nice design on the outside, and the material is quite solid. There shouldn’t be any worries that the contents will be damaged in a rough shipping scenario. One lucky guy will get it for free during the promotion period. It is a great complement to the NEO X8-H and it is leaps and bounds ahead of the experience with the IR Remote Control. The NEO M1 is a 2.4Ghz Wireless Air mouse, complete with Six-Axis and a built in Gyroscope. It sports a simple design, but one that works magnificently. So, place your order quickly and get this Free Gift promotion before it disappears. The NEO X8-H comes with 2 different launchers out of the box. 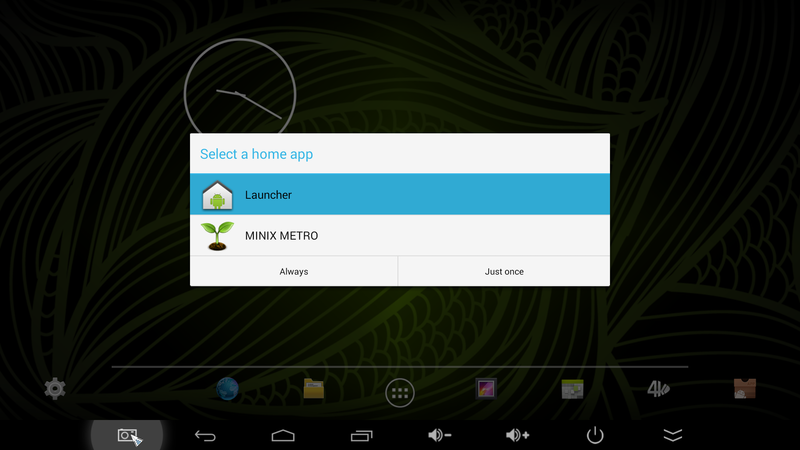 One is the Android Original Launcher whose features are the same and shouldn’t come as a surprise to anyone, so the one we’ll be focusing on now is the MINIX UI. tucked away in the Statusbar. You also have an arrow to hide it if you choose. 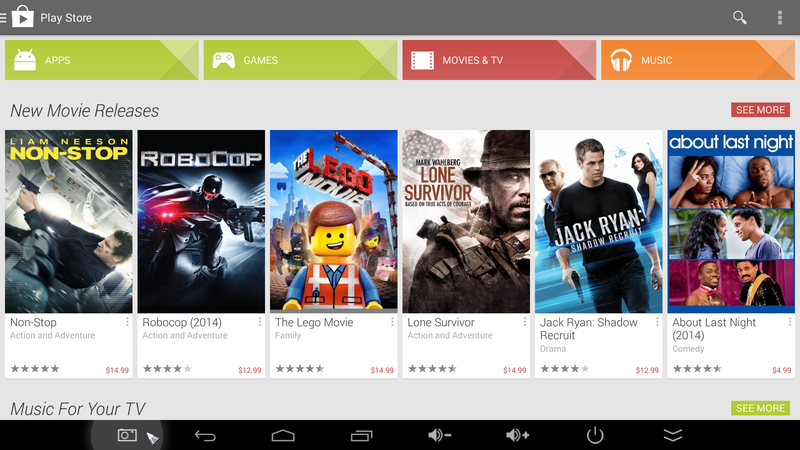 Apps like the Google Play Store, Netflix and Skype are already built-in, and the experience with them is detailed a bit further below. 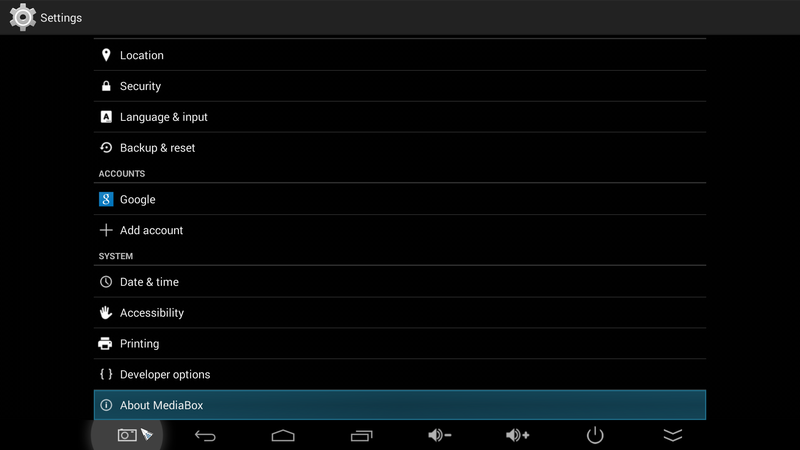 Now let’s check the Settings menu on the MINIX UI. 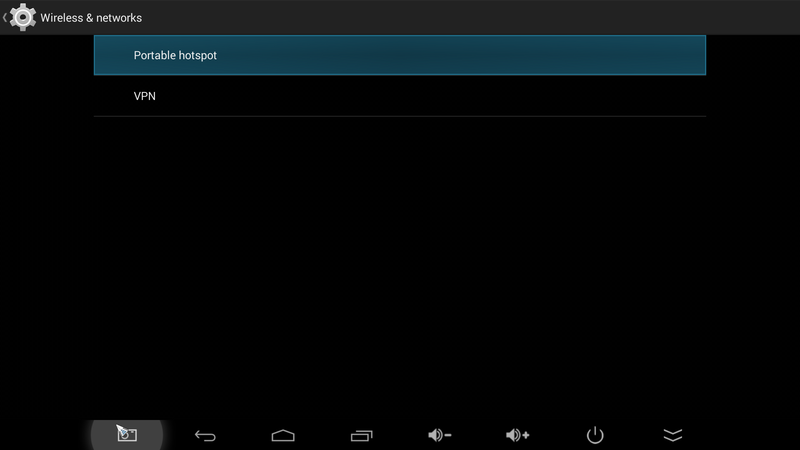 On the Network tab you can check and pick your Internet connection settings and if you’ll be using a wired or wireless connection. 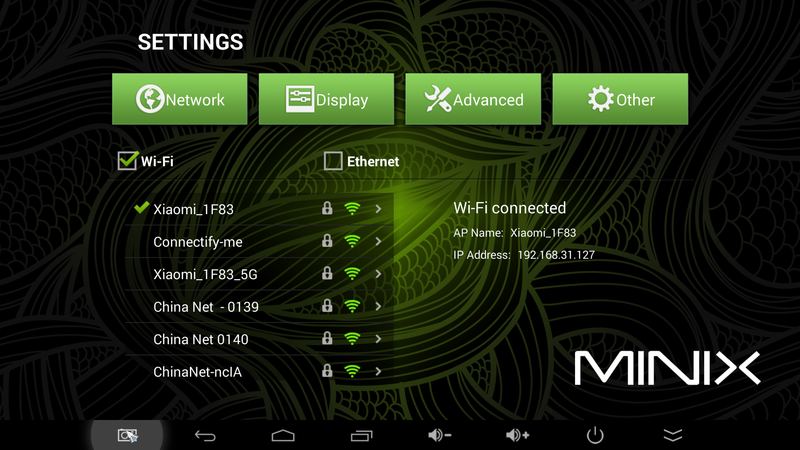 You can see on the screenshot the NEO X8-H connected to our Xiaomi router’s 5G network, confirming that it works without a hitch on Dual Band networks. Going to the Display Tab we can set the HDMI resolution, toggle the Statusbar visibility and pick the Screen Saver settings. If HDMI auto-detection is enabled, then the NEO X8-H will follow true to the settings name and give the appropriate screen output for your screen. The X8-H supports a top 4K UHD resolution output. The full list of resolutions is 480I, 480P,576I, 576P, 720P 50HZ,720P 60HZ, 1080I 60HZ,1080P 60HZ,4K 24HZ,4K 25HZ,4K SMPTE. 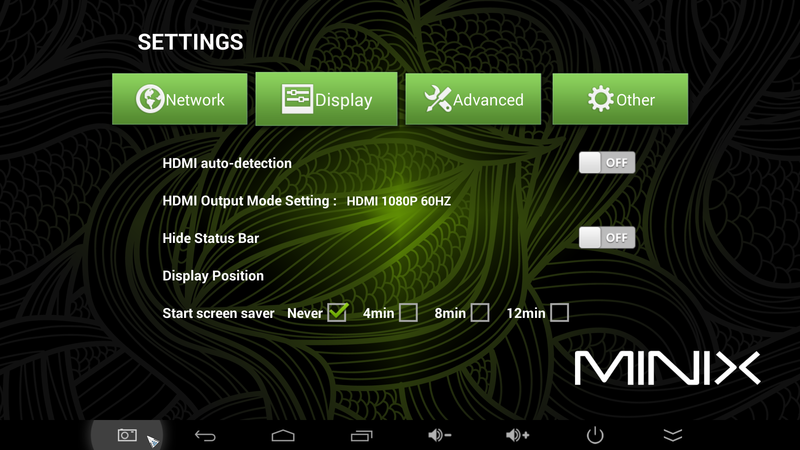 The Display Position option will allow you to modify the screen size, to fix Overscan issues. 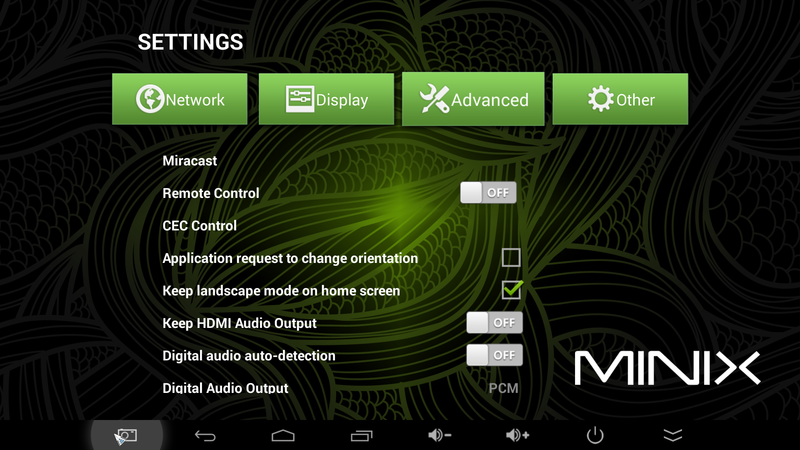 Miracast – You can use this to mirror your Phone / Tablet’s screen to your big TV. However Samsung, Sony and HTC devices are not supported due to HDCP compatibility issues. Click here to read the instruction for how to use this function. CEC Control—- Also known as HDMI-CEC, in short it allows you to use your TV or AV Receiver remote to control the NEO X8-H through the HDMI connection. For this to work you’ll need to check that said TV or Receiver do support this protocol. 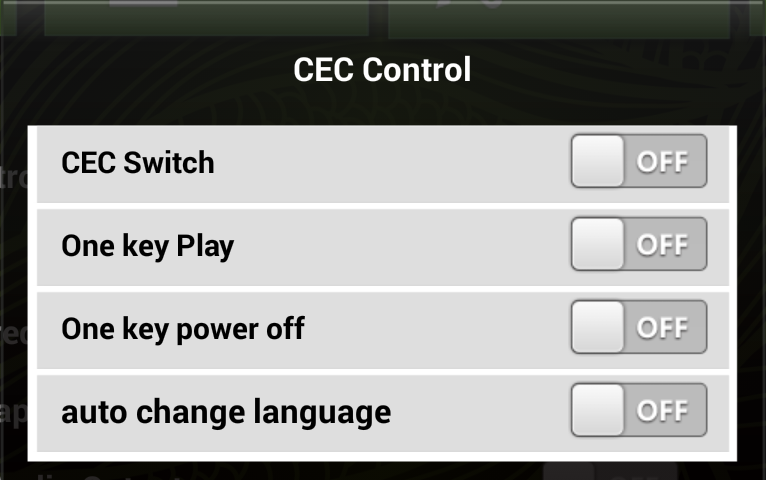 CEC can also be used to switch your TV (or receiver, you know the drill) on and off when the same is done to the connected device, and vice-versa. 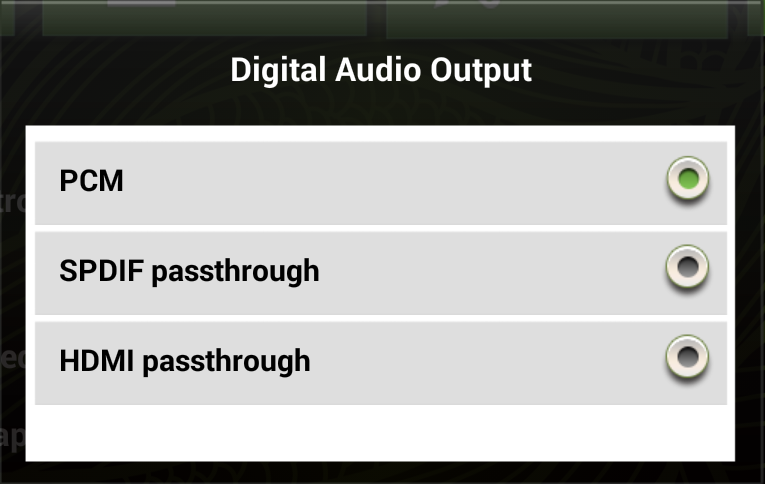 when you connect NEO X8-h with your receiver, you should make the change here, spdif or hdmi passthrough is all ok. click here to read the passthrough review of NEO X8-H.
You can use NEO X8-h to set hotspot, function working .also VPN is also working if you know how to set here. 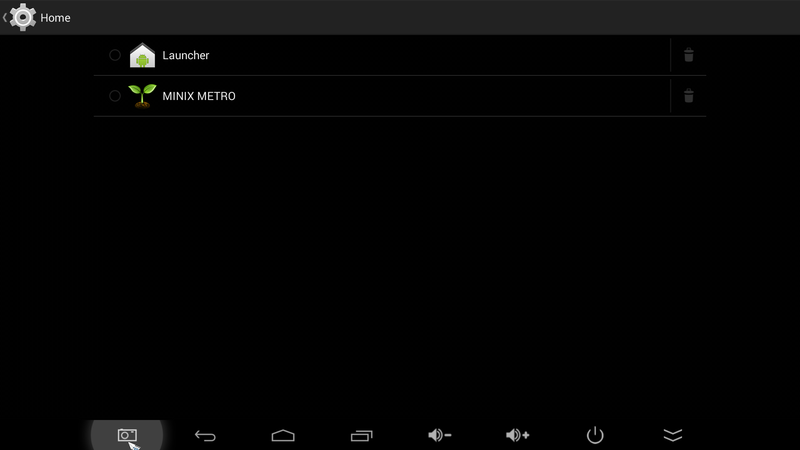 If you want to change the default launcher, change the setting here. 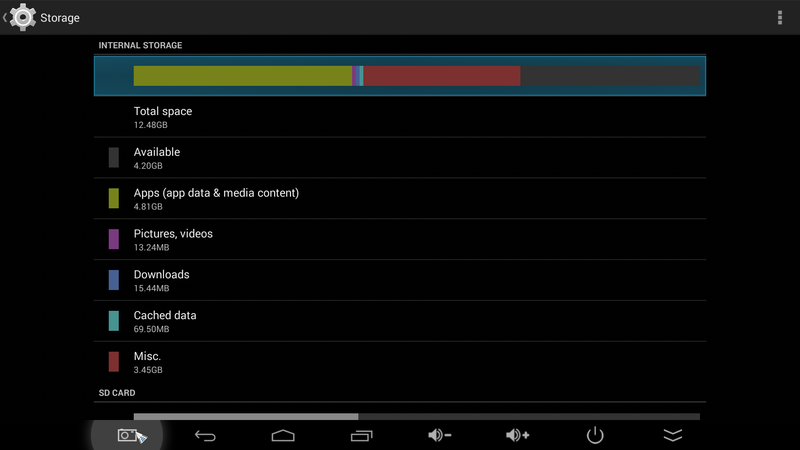 Total is 16GB, and system,and preinstalled apps take some storage, so everything is fine. This is the NEO X8-H built-in media player. Because NEO X8-H use the amlogic s802-h chip, so it should be able to hardware decode the Dolby and DTS video, so i tested with a lot of different format full hd dolby dts file, all working good with hardware decoding. 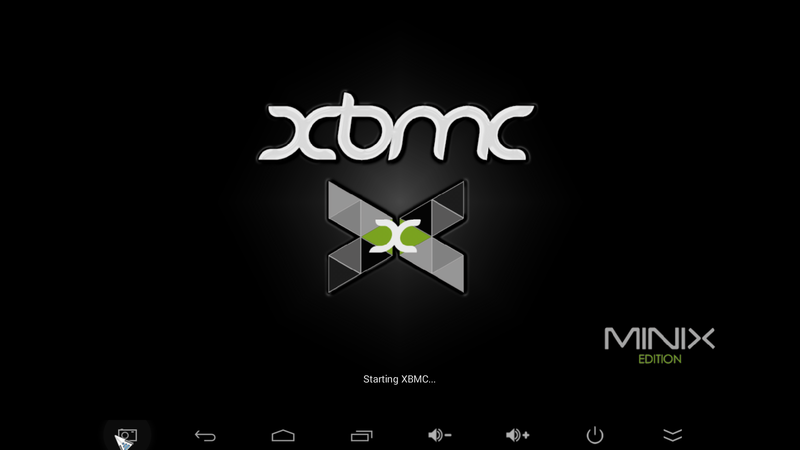 while for NEO X8, i think you just can use XBMC to do the software decoding,and play those files. 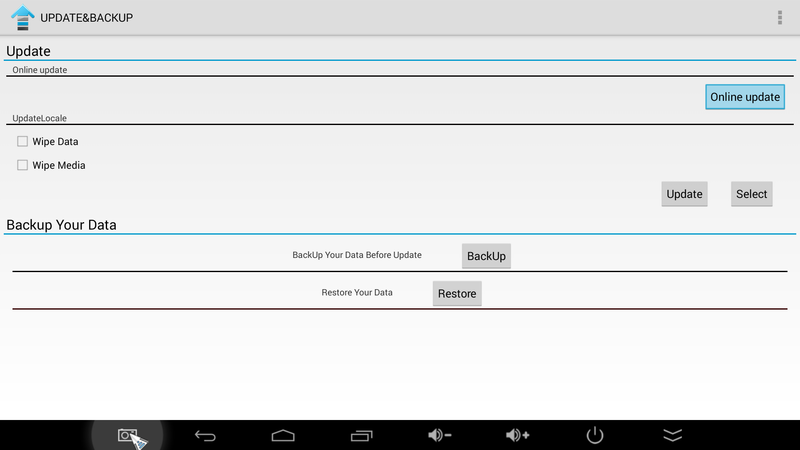 This is a very important app in the system, future OTA update, and data backup are all base on this apps. 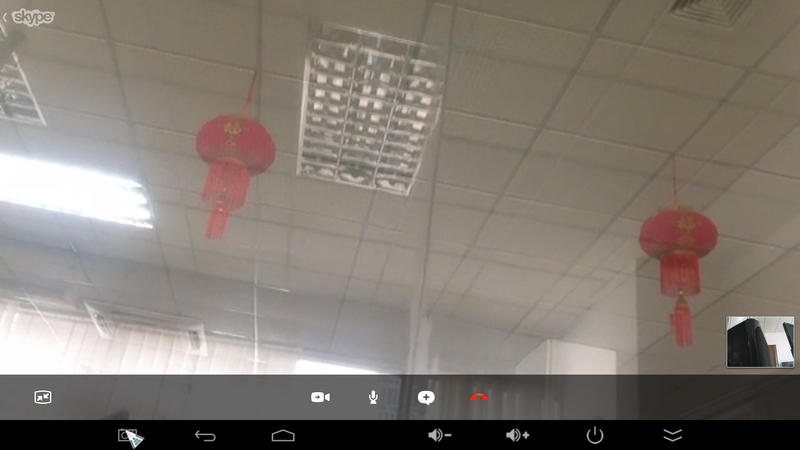 We’ve tested the Video Chat, and all worked as expected. The tested cameras were Logitech’s C170 and C270. We were unable to test the HD version of Netflix, so this experience is of the “regular” version. Making a connection through a VPN, the streaming worked as intended with nothing of note. We were also questioned if 5.1 passthrough was working on Netflix, but as we couldn’t find a video for the test it was skipped at the time. Get back to us with one such content and we will update this area of the review with the results. 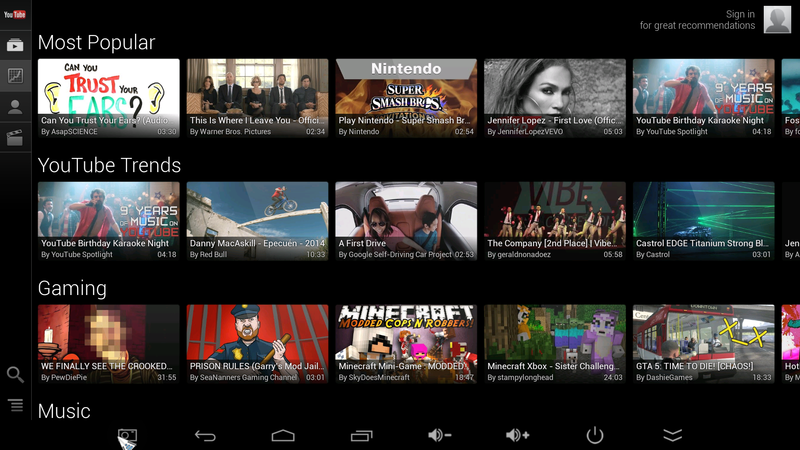 YouTube works without any problems, and the interface makes it very easy to be used from the couch. NTFS: Read OK, but failed to write. It appears to be a common problem with this Amlogic device, and we are in talks with the developer to see if there will be a fix or workaround. 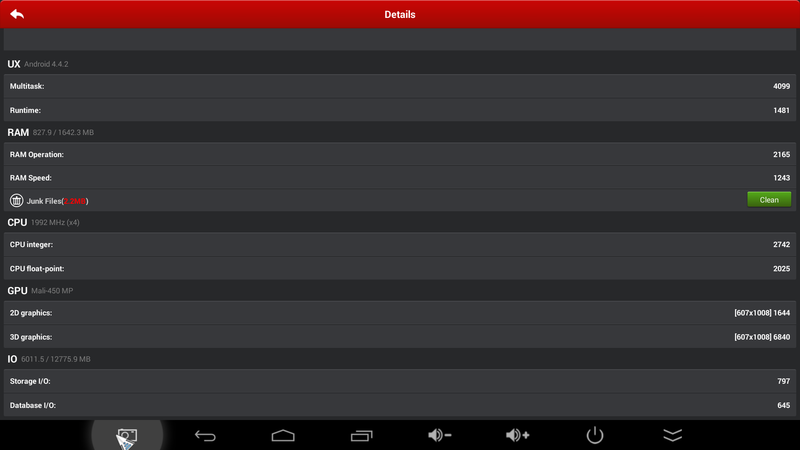 The Sandisk card had the same results on both scenarios. For greater compatibility, ensure that your External HDD’s have a separate power supply, as the USB doors of the X8-H may not supply then with sufficient power. 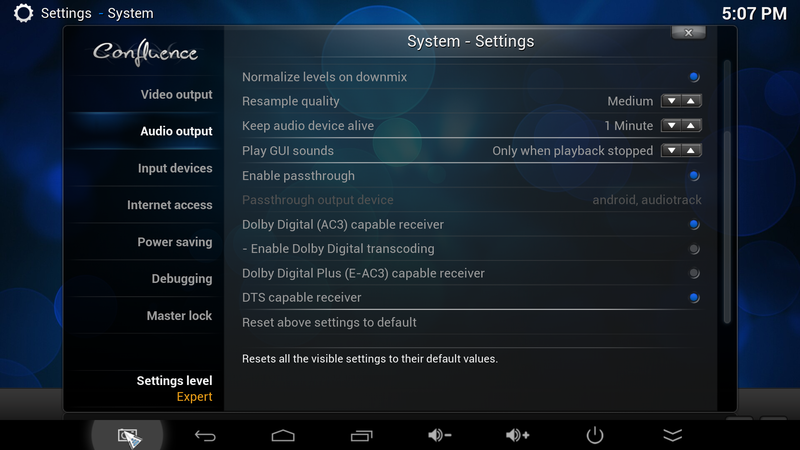 1 Dolby (AC3) 5.1 optical passthrough ——–OK， but with noise. 2 DTS 5.1 optical passthrough——–OK， but with noise. 3 DTS-HD HRA 5.optical passthrough——OK， but with noise. 4 DTS-HD MA 5.1 optical passthrough—-OK， but with noise. The method to stop the noise is to simply mute your TV. This is a common issue in other Amlogic devices, and while an official solution isn’t available, this workaround does the trick perfectly. 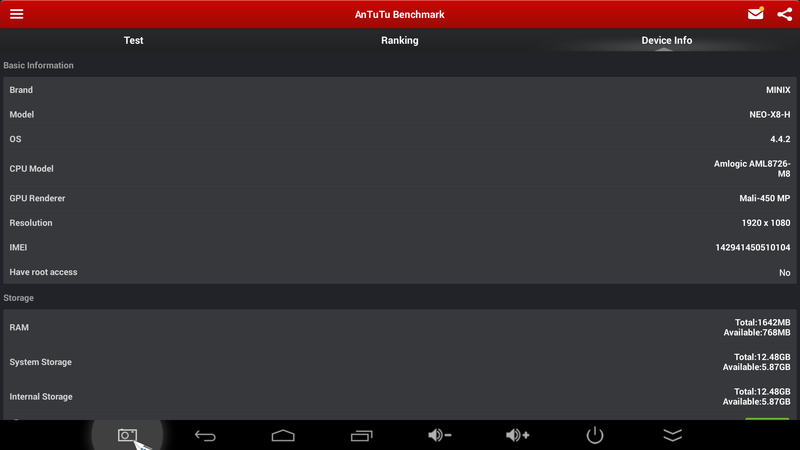 Don’t ask me why the antutu score is not 30000 , MINIX tell me the amlogic s802 chip should get 23000-24000. I don’t know why. but for me, the score is useless for me, performance is really important than that. Sorry to make you guys wait so long time to see the game performance review. I am always waiting for a good game controller for the neo x8-h. before i test the G910 bluetooth game controller, however, the set up is a little hard for regular customers, and then tronsmart inform me that they release this tronsmart mars g01 game controller, a 2.4ghz wireless game controller, which support plug and play. Compare with G910, The set up is really super easy. It also support two player together. So compare with the rk3188 chip, the neo x8-h features the amlogic s802, and the GPU is Mali 450, better than then old Mali 400 GPU on RK3188. So the game performance seems a little better RK3188 device, but honestly,i don’t find “huge” improve on games. 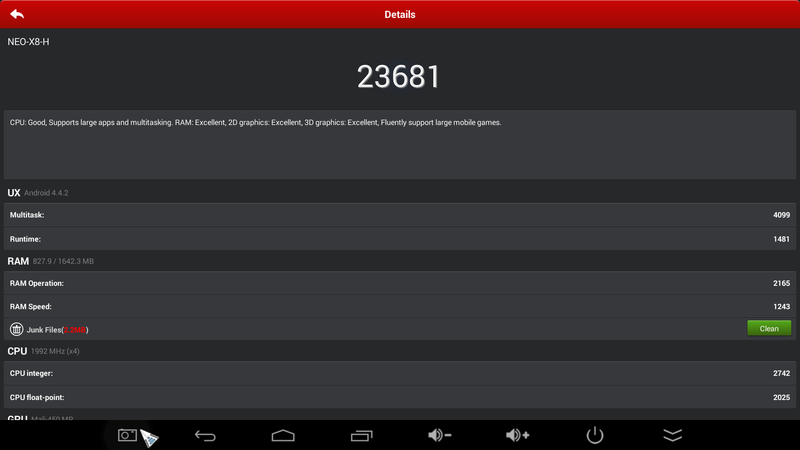 The game loading speed seems faster than the other rk3188 device. I guess i will have to wait to check the RK3288 device, and use the best Mali-760 GPU will bring huge improvement on the game performance. Above is what i have testing today, I still download some games to test, but have no time to play and write reviews today, i will update this review tomorrow when i get a chance. If you have anything want me to test, feel free to leave message. 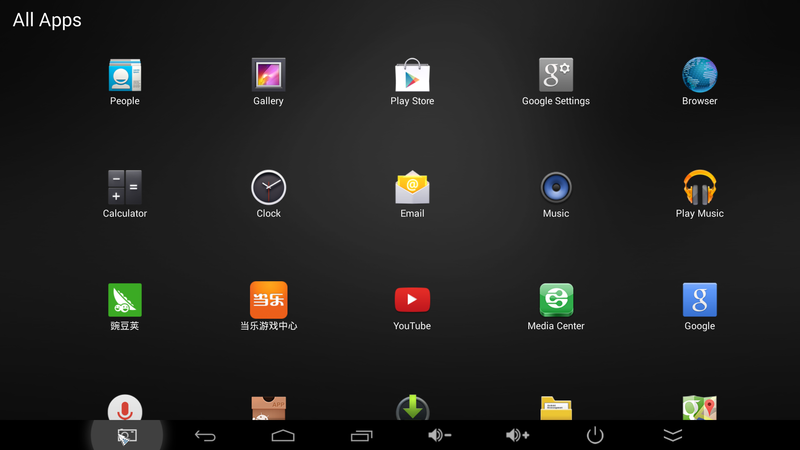 iFive Mini3 Also Can Upgrade Android 4.4 KitKat OS, Try To Upgrade Now! Will Minix be releasing a box with the RK3288 chipset? 1. 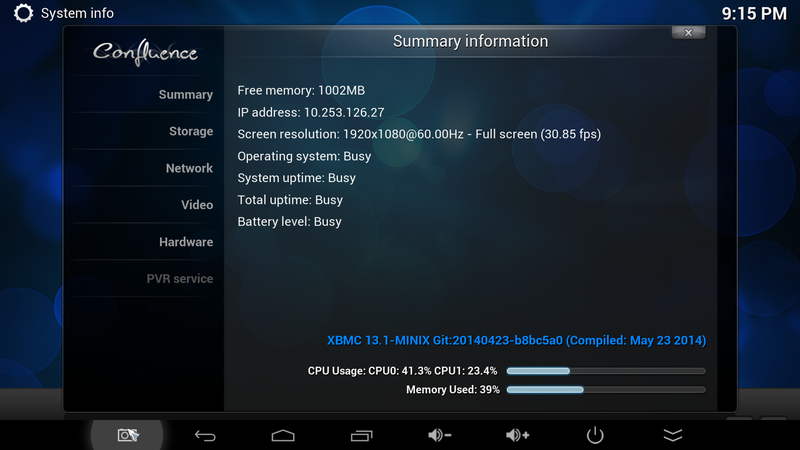 Can I install and run heavy apps/games on micro SD card so I don't need to buy the expensive X8-H model with 16GB? 2. Is Minix X8- H performs better than Vega S89-H better in performance than ? thank you first of all for that great insight. However, I am still not informed if and how the player will handle 3D content (ISO, MKV-MVC; M2TS....) and the suitable container formats to it. 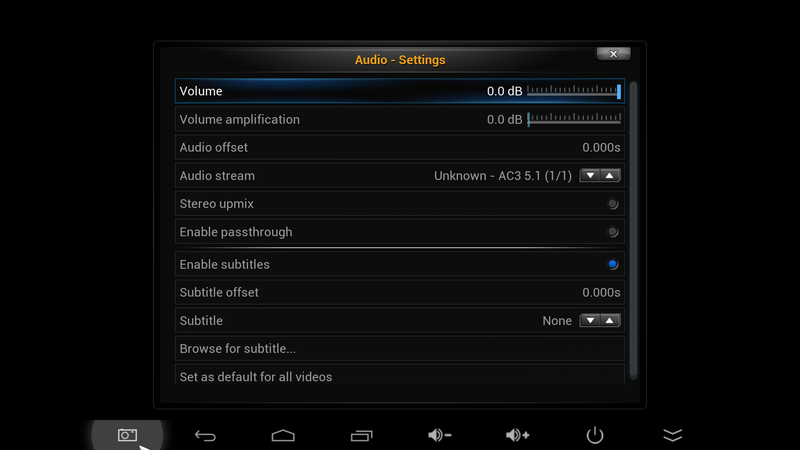 What about HD-Audio Passthrough outside from XBMC? Please also test this and let me know. Thx. Great post! I was very curious about it. Does NEO X8-H play Blueray ISO? Do it play blueray menu? yes,it play blue ray iso, it play 3d iso blue ray, but no blue ray menu. 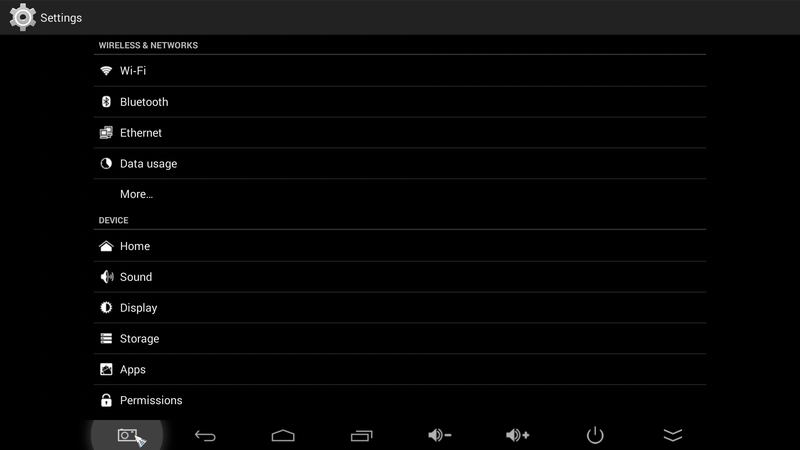 can play blue ray iso, and 3d iso blue ray, but no blue ray menu. How do you trigger 3D playback? It does not work on my X8s and 2D is played instead? 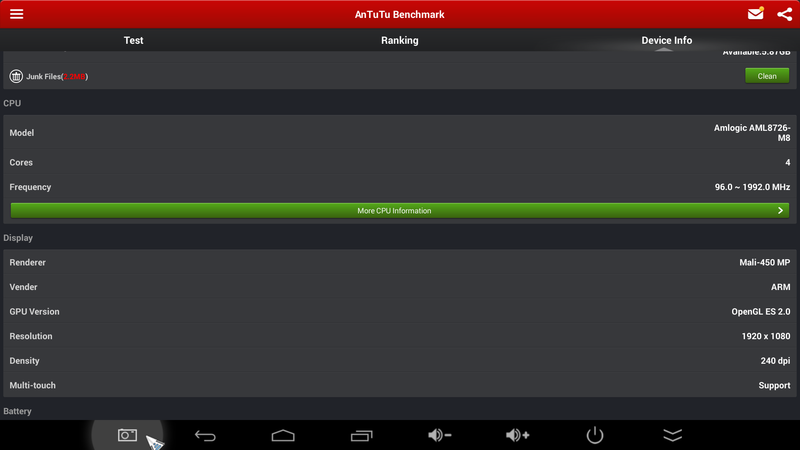 has the Minix quality and reliability gotten better. I had an X4 and haven't bought a Minix since then. I returned it. 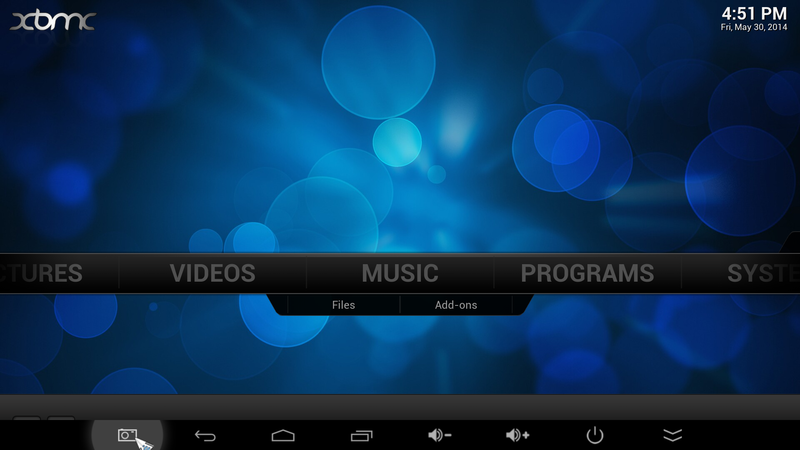 Although the lack of flash support, can it play streaming video through browser? I would like to play on-line tv on web pages. is it ok to install or use this in a smart tv? can you let me know which on-line tv you want to play? I can test for you. I can watch youtube videos through browser without problem. Ok, i will test, and report back later. Can you explain how can you watch youtube through browser if in your review " -browser " says that it doesn't have Adobe flash support? Or are you using the hacked flash player?. I checked the link and it's broken. 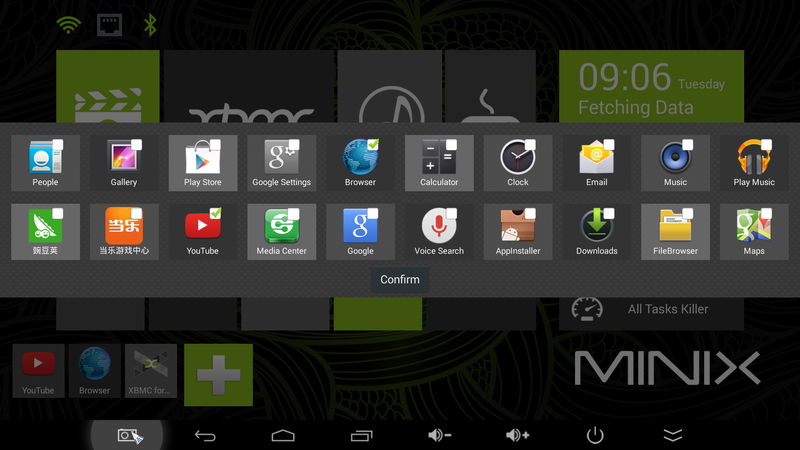 And how about the the android original browser? does flash P. work with it? 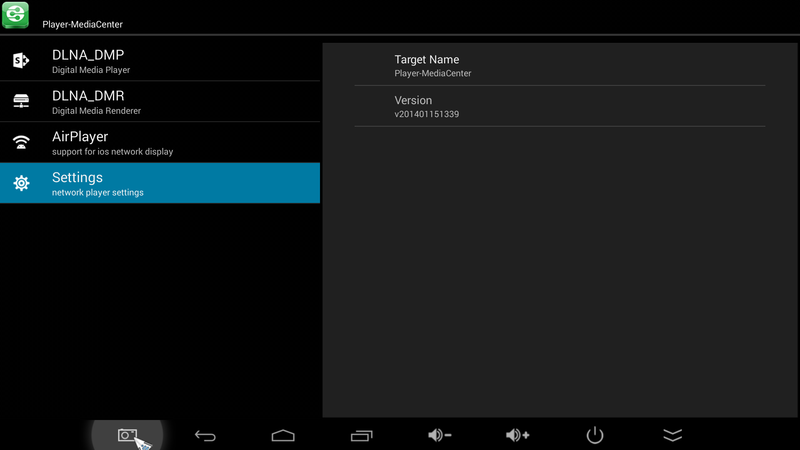 you didn't mention that but I think will be same No cos the android version? Another thing, can you power On and Off this box with the remote? or you have to physically press the switch. first for flash problem, it's not the minix fault, adobe flash don't support android 4.2 or above, for chrome,firefox or stock browser, but i have heard, people can use dolphin browser with hacked flash player to watch online videos. second question's answer, yes,you can use the remote control to power on and off the device, no need to press the switch. Did you try to connect USB DVD drive and play DVDs? Please check it for me. Yes, and just make sure your SMART tv have the HDMI port, and just connect to the hdmi port,and switch to the correct hdmi mode. We don't have a USB DVD Driver, we just test with usb hard driver, and it can work well. I don't think it will support the USB DVD Drive, because you know, this neo x8-h run android, and it's hard to find a working usb dvd drive in android. Well,i have to the Minix quality is very good, compare with other china brand, of course, they sell it at high price, but they also use have good quality. Hi eric! 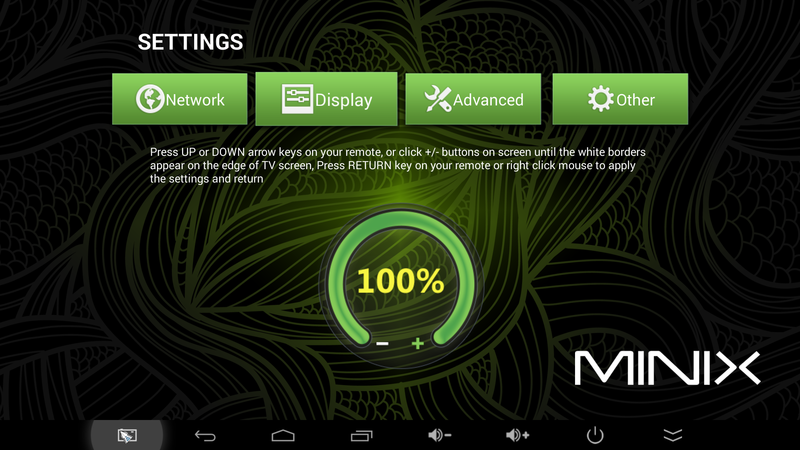 I just got my minix neo x8-h for couple weeks now and im still exploring it. What i noticed was when im watching movies, shows, new, etc on xbmc was that it reboots after an hour or even less than an hour. So i have to go back again... Whats the fix on this?